There is something wonderful about discovering that someone or something is better than I expected. To illustrate my point, I’m sharing a cookie recipe that at first glance seems rather ordinary. When I first discovered it in the May 2003 issue of Parenting magazine, I was underwhelmed. A plain Jane oatmeal cookie with no spices, fruit, nuts, or chips and only a hint of almond flavoring (which I don’t even like) to jazz things up – why should I even waste my time? 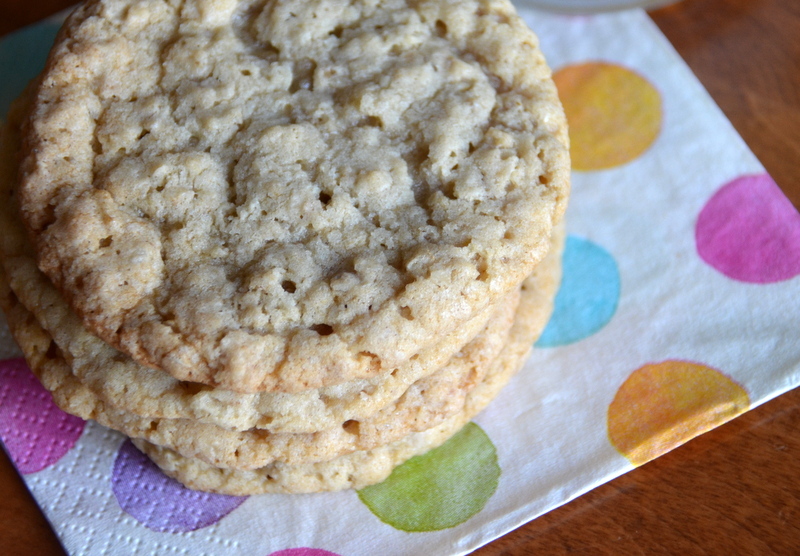 But the cookie’s hefty title kept nagging at me; I couldn’t let it rest until I found out why these particular oatmeal cookies were the “best-ever”. After baking the first of many batches, I realized I needed to raise the bar on my idea of simple oatmeal cookies because the goodies coming out of my oven were anything but boring. Everything about these mellow morsels is pleasantly surprising. The dough is ridiculously easy to put together and the ingredients are probably already in your kitchen. (Unless, of course, you are like me and have to make a special trip to the grocery store to pick up that exotic almond extract). 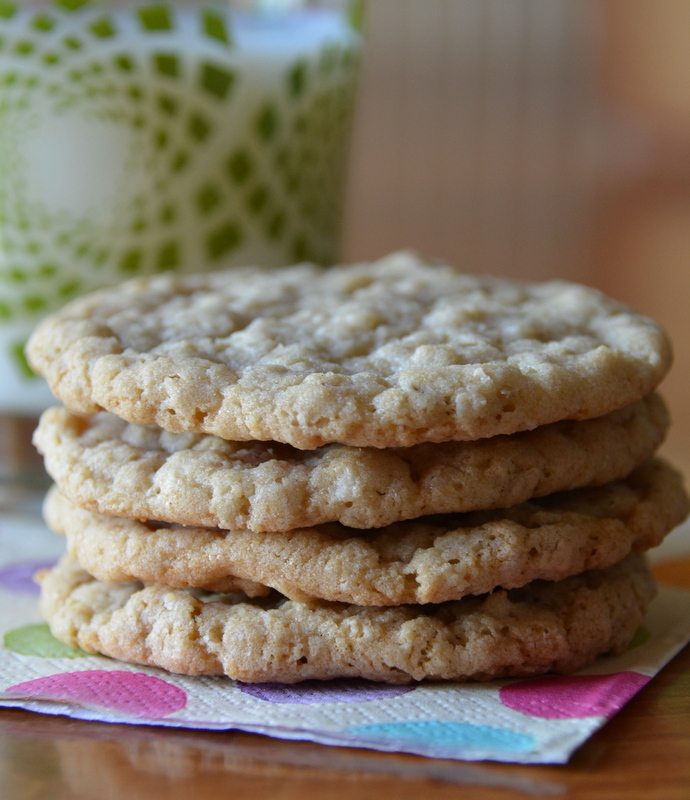 The cookies bake up really airy, are just sweet enough, and have a wonderful chewy texture. And the almond extract, which I originally wrinkled my nose at, is the ingredient that I think takes these cookies from ordinary to extraordinary. Now, let’s be honest. Best-Ever Oatmeal Cookies are not showy, frou-frou, center-stage cookies for baby showers and Christmas parties. They are humble workhorse cookies meant for snacks after naptime and school and for lunch boxes and road trips and days at the beach. They have no aspirations to be anything but utilitarian and that’s OK. They can handle the ordinary every day cookie responsibilities – dipping in milk or hot chocolate, sandwiching a scoop of vanilla ice cream, popping in someone’s mouth straight from the oven or later from the cookie jar – and they do it with delicious grace. Go on. Give them a try. And be prepared to be pleasantly surprised. 1. Preheat your oven to 350°F. Cream both sugars, butter, vanilla and almond extract in a bowl for 2-3 minutes until pale and fluffy. Add the eggs, one at a time, and mix well. 2. Mix the oatmeal, baking soda, and flour in a separate bowl; add to the butter and sugar mixture and stir together until everything is incorporated into the dough completely. 3. Drop the dough by teaspoonfuls onto ungreased baking sheets. * Bake approximately 12 minutes, or until lightly browned around the edges. Cool cookies slightly before removing them from the cookie sheet. Cool completely on cooling racks. Yields approximately 3 1/2 dozen cookies. *I like to use parchment paper when I’m baking cookies. It keeps the bottoms of the cookies from getting too dark, they don’t stick to the baking sheet and clean-up is a breeze. Thanks for the recipe, will have to try! You’re welcome. I hope you enjoy them as much as we do. Wonderful recipe I guess..if I were to go by your promising word.. They are very, very good. One cookie is never enough. I’m such a sucker for a good soft oatmeal cookie! Me, too. They are such a comfort food for me.